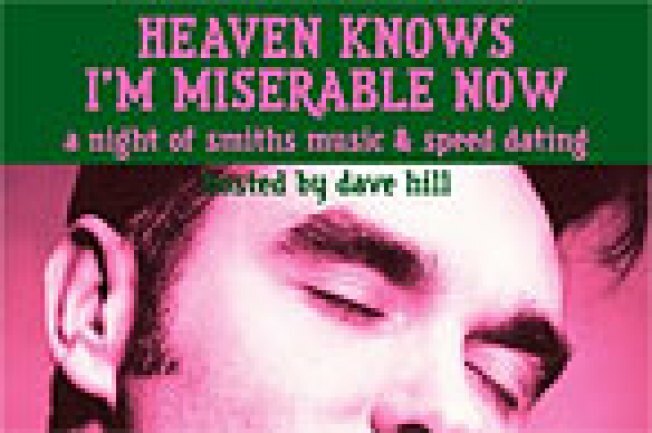 Last night, 60 of the most awkward people in New York convened for Heaven Knows -- Miserable Now, a Smiths-themed speed-dating event at Black Rabbit in Greenpoint, and it was, as you might imagine, awkward. For example: Among the single souls who turned up hoping to use mildly suicidal rock music as a basis for true love was your Intel correspondent's ex-girlfriend. Along with every other single girl in Brooklyn. It turns out that putting Morrissey's face on a flyer for a singles event is the female hipster equivalent of offering free beer and game balls to Jets fans. By 8 p.m., the throng inside had already assumed rush-hour subway proportions, a healthy majority wearing lipstick. "I have a strange and unpleasant announcement to make," host Dave Hill, a comedian (and fellow Intel correspondent), announced. "There are too many women and not enough men. We're not sure what to make of this, but we have to close the registration to women." Oddly, there was no gay component to this event, but that detail seemed overlooked in the scrum. "Is this for real?" our female friend wrote in a text after being denied a spot. "The girl with the Smiths tattoos got turned away from Smiths speed dating?" The rest of the night progressed like regular speed-dating apparently does. Short conversation blurred into short conversation until we were sweating beneath our cardigan, our mouths dry. "Look, it's not going to happen with me," our fifteenth new friend said, to our relief. "Do you want to just take a break?" By the end of the night we'd talked to about half the people on the list, but eventually wound up sitting at a table with our ex and her friend. Eventually, our male friend starting making out with our ex's friend, proving that the tried-and-true dating method of alcohol and mutual acquaintance still works. We sat beside them, awkwardly trying not to watch. Welcome to the Home Prison of Bernie Madoff!